Start with a straight grained log of suitable dimensions. 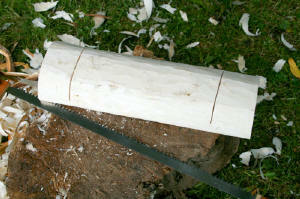 If the wood is still fresh that will make the carving easier. 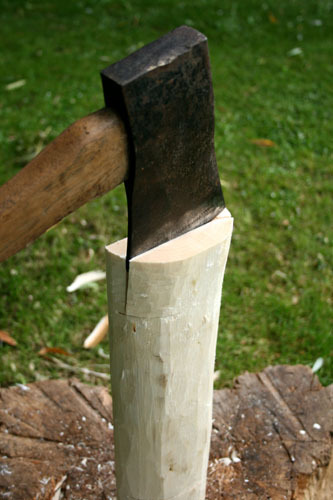 Chop it down the centre with an axe. Choose the most uniformly shaped half to work with. 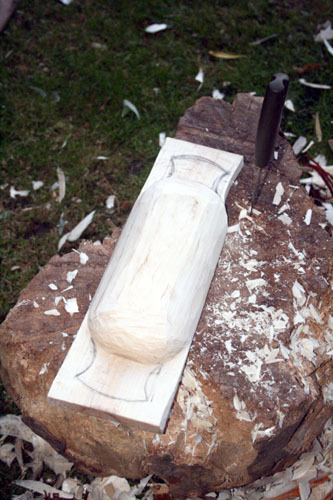 Carve the split surface smooth and flat. Also, carve the bottom slightly flat so it will not rock over onto one side. Chop off excess wood forming the basis for the handles. 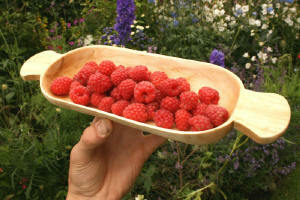 Now round off the ends of the bowl section with a knife. With care, a hatchet can also be used. 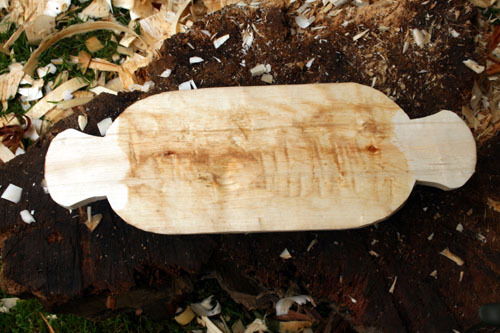 Now mark out your handles and begin to carve them to shape. Continue refining the shape and form in general until you're happy. 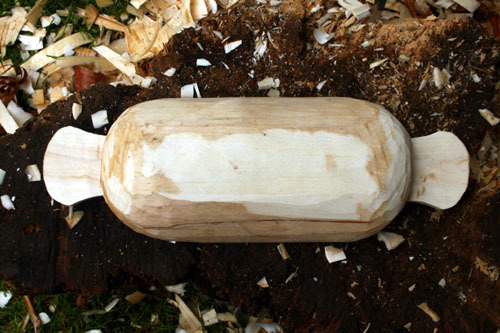 These carving jobs can take a while. If you decide to stop and carry on the next day, put your work in a plastic bag so it doesn't dry out and become harder to carve. Carving out the bowl: Using a spoon knife, start out by carving across the grain. 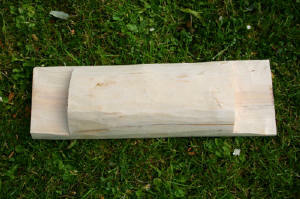 It's best not to carve too close to the edges until the majority of the wood has been removed. The first cuts can be tricky, but once you have a purchase on the wood it becomes easier for the cutting edge to bite. 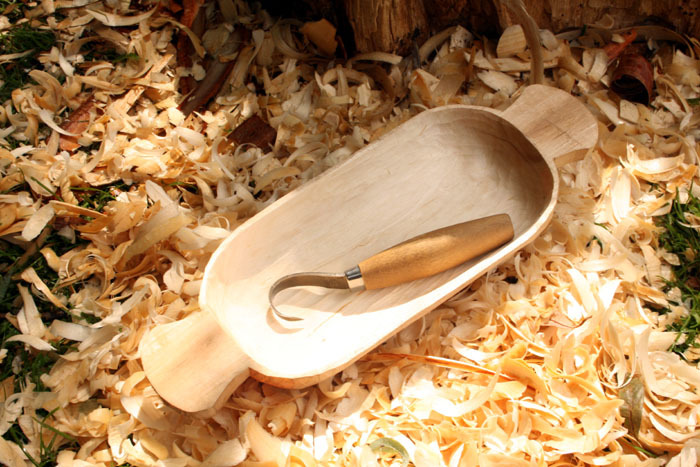 Carve with a sweeping action to scoop out the wood. You can use any part of the cutting edge to tackle tricky areas. This job can be hard on the hands. If it feels like you may develop blisters, wear a pair of leather gloves. Try to carve the dish so that the walls are an even thickness, gauge where you need to take more wood off using your fingers like callipers. 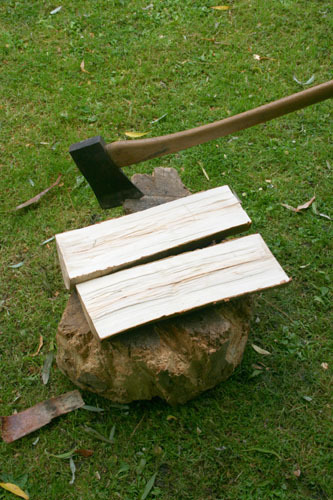 It can be wise to leave the wood a little thicker near to the handles. 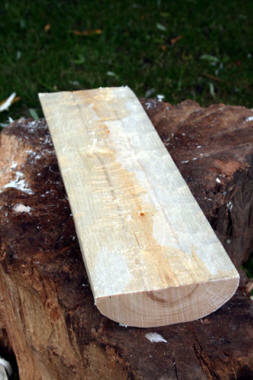 If thick wood suddenly meets thin wood it is likely to crack at this point when the wood dries. Finishing off: When the carving is complete, place the dish inside an open bag (paper bag is best) for as long as it takes to dry out. 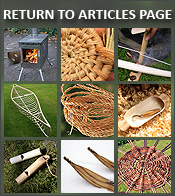 The bag will slow down the rate of drying which should prevent the wood from splitting. I like to put the bag on its side so that any evaporation does not quickly just go straight up and away. Once dry, you can sand the wood smooth if you like. Start with coarse grade paper and finish with fine grade. Alternatively, you could make a really clean job of the carving; even tool marks have quite an attractive quality. You can also wipe the wood over with some food-grade oil to bring out the natural colour and enhance to grain. I used vegetable oil but mineral oil is preferable.